LONDON--(BUSINESS WIRE)--The global tyrosine kinase inhibitors market is expected to post a CAGR of over 8% during the period 2019-2023, according to the latest market research report by Technavio. A key factor driving the growth of the global tyrosine kinase inhibitors market is the growing prevalence of cancers and ophthalmic diseases. With factors such as unhealthy lifestyle, genetic mutations, obesity, and environmental changes, there has been an increase in the prevalence of various types of cancers and ophthalmic diseases such as retinal vein occlusion (RVO) worldwide. Medical conditions such as hypertension, diabetes, and open-angle glaucoma are the high-risk factors for RVO. The high prevalence of various types of cancers and RVO will stimulate the growth of the global TKIs market during the forecast period. This market research report on the global tyrosine kinase inhibitors market 2019-2023 also provides an analysis of the most important trends expected to impact the market outlook during the forecast period. As tyrosine kinase inhibitors (TKIs) have demonstrated efficacy in various oncology indications, several companies are focusing on expanding their clinical reach. With the aim to improve the treatment of various types of cancers, there are over 1000 clinical trials that are being carried out by various companies and two combination therapies were recently approved. Such an expansion in the research areas of TKIs will have a substantial impact on the global TKIs market during the forecast period. “Apart from the growing prevalence of cancers and ophthalmic diseases, factors such as the high target affinity and specificity of TKIs, and the recent approvals of TKIs are expected to boost the growth of the global TKIs market during the forecast period,” says a senior analyst at Technavio for research on pharmaceuticals, biotechnology & life sciences. This market research report segments the global tyrosine kinase inhibitors market by product (RTKIs, and nRTKIs) and geographical regions (APAC, EMEA, and the Americas). The Americas region led the market in 2018, followed by EMEA and APAC respectively. Although the APAC region held the smallest share of the market in 2018, it is expected to register the highest incremental growth during the forecast period. 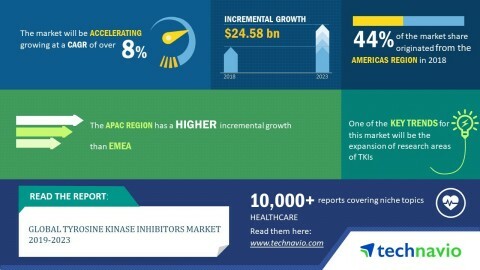 The global tyrosine kinase inhibitors market is set to post a CAGR of over 8% during the period 2019-2023, according to Technavio.